The company I work for is running some seminars as part of Mental Health Awareness Week. One of the speakers was Matthew Johnstone, Kiwi, artist, advertising creator, survivor of the 9-11 attack on the World Trade Centre, and a sufferer from depression. 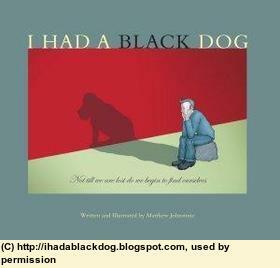 Matt spoke about his long struggles, and how he eventually composed his book "I Had a Black Dog". Matt is a great communicator and cartoonist, and his book has few, but well-chosen words, and great cartoons. It tracks the course of his own depression and recovery (not cure). He spends a lot of his time now touring around speaking to any who will come to hear, including struggling farmers in the drought ravaged parts of Australia. Get the book. Leave it lying around where folk can find it (eg, on the coffee table) - it has already helped more than one to recognise their own black dog, and seek out help. 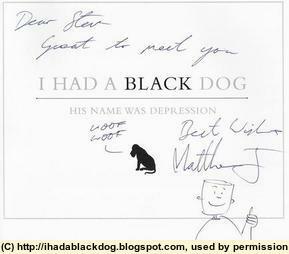 I shared my own experience of depression with Matt after the seminar, and he signed a copy of the book for me. BTW, if you haven't heard the expression "black dog" it was Winston Churchill who used the expression to describe his own depressions, and so popularised it.